Think you need a big band to rock your reception? Think again! Why deal with the hassle of hiring multiple musicians for your ceremony, cocktail reception and dancing? We do it ALL! We specialize in CUSTOM entertainment, creating the perfect atmosphere for your special day. As a married coupled ourselves, we see each wedding as an opportunity to renew our own bond, and to share our experiences with you in creating a fun, worry-free occasion, full of wonderful memories. We have many years of experience in working with wedding parties of all sizes, meeting their particular needs with confidence and enthusiasm. 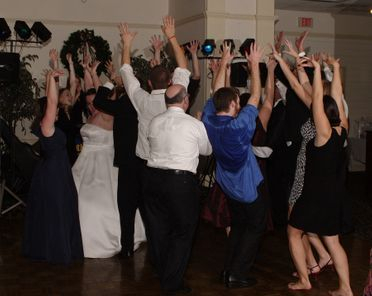 Latitude is committed to making sure that your wedding reception is unique. We work closely with the bride, groom, parents, and other vendors to ensure that the reception flows smoothly. It is this commitment to personalized service that sets Latitude apart. We are available to support, guide and answer your questions, from the planning stages, right up to the day of your event. Other bands play the same songs, in the same order, at every event. We believe that the music should be as unique as the event itself. We will help you to create a unique, one-of-a-kind musical experience based on your particular musical tastes, and those of your guests. Even with our extensive songlist, there are still some songs that we don't play. With proper notice, we are more than happy to learn your First Dance, Father/Daughter or other special songs. AND during our breaks, we will be glad to play your personalized songlist directly from your Ipod. During the course of the wedding reception, we will be happy to act as Master of Ceremonies, coordinating events like the bouquet toss, cake cutting, and the introduction of the bridal party. We will go over with you each name to be introduced, to verify correct pronunciation.....BEFORE the day of the reception. We will handle all of the details in advance so that you can truly enjoy this very special day.